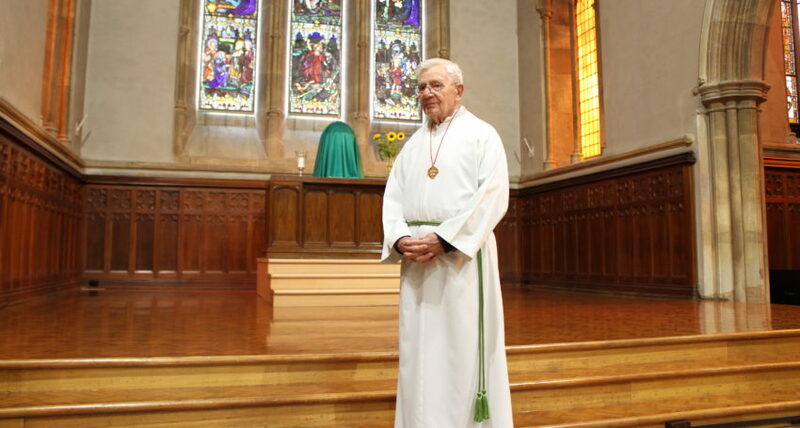 90-year-old altar server Leo Vandenberg is the oldest altar server in the Cathedral parish, and the Archdiocese – and possibly Australia. He serves at lunchtime Mass Monday to Wednesday, the Benediction and lunchtime Mass on Fridays, and then at both 6pm Masses on weekends. His commitment to the parish over the years has also included coordinating the extraordinary ministers, readers and collectors and he has been a regular volunteer at diocesan events. He and his first wife Teresa (who passed away in 1954) boarded a boat and after a six-week journey migrated to Australia in 1952. He was a locomotive driver, staying there on and off until his retirement. Leo became an altar server at St Francis Xavier’s Cathedral when he retired 25 years ago. In 2015, the Vandenbergs each received an Archbishop’s Award for service to parish life. While he did consider the priesthood earlier in his life, it was at St Agnes Youth Ministry he met his first wife. “I could go to Mass three times a day and I’d never get bored with it,” he said. As for the future, Leo said his life is in God’s hands and he will just continue to live by his motto of taking “each day at a time”. SHARE this Story to INSPIRE others to give their All to God and His CHURCH!